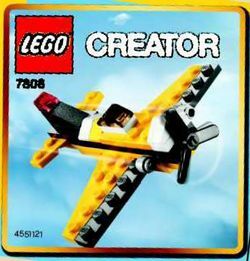 7808 Yellow Airplane is a LEGO Creator set planned for 2009 but was released in 2010. It contains 38 pieces to construct a mostly yellow and black aeroplane. This set was planned to be released in 2009 but it was subsequently released in 2010 as part of the Daily Mirror / Sunday Mirror Promotion. 66373 Fun Favor Pack contained four. Facts about "7808 Yellow Airplane"